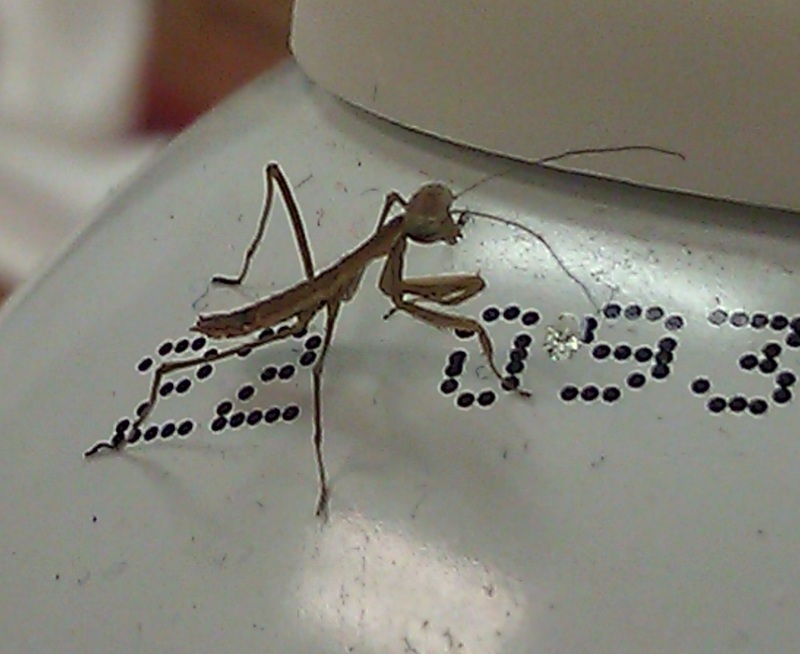 Newly-hatched preying mantis - isn't he cute!? So our lab ordered some mantids from Home Depot (which don’t seem to be available so I presume it’s a seasonal product) for predation experiments. I was under the impression that they needed specific conditions to hatch that wouldn’t be met until next June. Then someone noticed one crawling over a desk. Sure enough, there were a few dozen wandering aimlessly about, migrating away from the egg case that was sitting in a corner of the lab. I think we got most of them, but those that we didn’t catch should take care of our fruitfly problem! Mantids are awesome. Some years ago, I was living on the 9th or so floor of an apartment building in Toronto, and had 2 cats that I would let out on the balcony. One day I noticed that there was a bit of commotion: there was a largish preying mantis who seemed to be holding her own against the pair of them by spreading her wings (complete with eyespots) and hissing every time they would approach. I put the cats inside, caught the mantis and released her in a nearby field, where I hope she enjoyed the rest of her natural life feeding on grasshoppers (and an occasional mate).